Flue pipes maybe called smoke pipes, chimney connectors and flue connectors. CSA B365 refers to this pipes as Flue Pipes. Flue pipes run between the wood burning appliance collar and the entrance to the chimney. The Flue Pipe is an important component because its size, length, arrangement and installation affect the performance and safety of your wood burning system. Improper installation can endanger your home and your family. 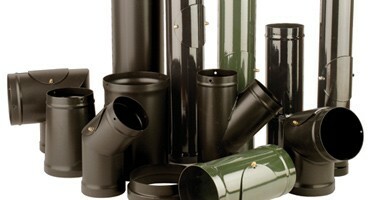 Currently flue pipes are available in a variety of materials. Blue steel pipes are made of un-coated steel and are typically not suitable for use with a wood burning appliance.